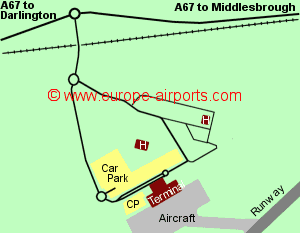 The nearest train station is at Darlington, approximately 10Km from the airport. Bus services link the airport to Darlington, Middlesbrough, Stockton, Hartburn, Yarm, Eaglescliffe and Long Newton . Durham Tees Valley airport has 3 bars/restaurants, 2 shops, a currency exchange facility, an executive lounge, a number of Pay as you Go Internet access points and WiFi Internet access (FREE for 30 mins). The 3 star St George Hotel (with conference facilities) is located 200m from the terminal and the 2 star Teeside Spa hotel is located at a distance of 400m. In November 2010, the airport introduced a Passenger Facility Fee (PFF), requiring a payment (6 pounds for adults and 2 pounds for children) from all departing passengers. Passenger numbers totalled 131,000 in 2017, a fall of 1% compared to the previous year, and way below the 918,000 figure for 2006.